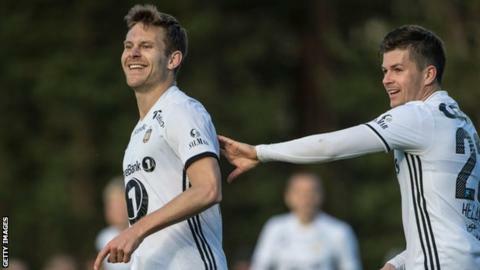 Former Celtic manager Ronny Deila expects Rosenborg to try to hit the Scottish champions on the break when the sides meet on Wednesday. The Norwegian side visit Celtic Park this week in a Champions League third qualifying round first leg. Deila manages Rosenborg's Eliteserien rivals Valerenga in his homeland. "Their best skills in the team are defend and counter attack," the 41-year-old coach said of the Trondheim team. "That will suit them and that's what they want to do in Celtic Park - they want to stay a little bit higher than maybe Linfield was doing. "But, of course, if Celtic's very good. Rosenborg will try to break on the counter attacks, a little bit like Molde did against Celtic when I was the manager - so 4-5-1, quite low and very quick on the counter with quick wingers. "It's the best team in Norway by far in the last seasons. They have tradition and they have consistency in culture and style of play, so it's very easy to know what Rosenborg is going to do. "They're not thinking about hiding something. Everybody knows what they're going to do. "They just want to do it good enough that Celtic are going to struggle. "They are very similar to the Dutch football - 4-3-3 with two offensive midfielders and quick wingers. "They have the best academy - a little bit like a small Celtic in Norwegian style, but at the same time, not even close to being as big as Celtic. And the team this year is not the best. "They were better two years ago and much better 10 years ago." Deila believes injured winger Pal Andre Helland is "a big loss" for Rosenborg and says former Arsenal striker Nicklas Bendtner has underperformed. The 29-year-old Denmark international joined Rosenborg for the 2017 Eliteserien and has scored six goals in 20 games, with his side five points clear at the top of the division. "He hasn't performed very well," Deila said of Bendtner, who also had spells in England with Birmingham City and Sunderland forward. "He's scored some goals in set plays, but if you're a striker in Rosenborg, you should score 20-plus every year and he hasn't scored that much and also hasn't been good in the open play either. "When he has a goal chance, he has very good technique and is a good finisher, but he doesn't come to enough goal chances. "They brought him to the club because he's going to be the main man when it comes up to games like Celtic." Brendan Rodgers replaced Deila at Celtic last summer and led the Glasgow side to the Champions League group stage and the domestic treble, the latter feat without losing a match. Deila insists he was "not very surprised" by his successor's debut season and says the Northern Irishman is "a fantastic manager". "It's a fantastic culture in the club - they are used to winning," Deila said. "Celtic now is way above all the other teams in Scotland and you can see that also when you look at the results in Europe and also in the league table." The Norwegian was also asked if he felt he could have achieved more success with more investment, having secured successive Premiership titles and a Scottish League Cup during his two years in Glasgow. "You can always think about that, but at the same time, I knew what the deal was when I signed the contract," he added. "It was about building up young players and bringing talented players and trying to get them to get up to the highest level. "A lot of the players who are playing with Brendan last year and this year as well are players that got a chance when I was the manager. I'm of course proud of that. "We won trophies, but in the crucial games in Europe, we were not good enough, like Malmo away [2015's Champions League play-off defeat]. "That's the most irritating game if I think back to the time. "I'm not angry at anybody. I enjoyed the time and learned a lot. "This was the first time I was abroad and managed a club like that so, of course, I feel much more competent and much more experienced as a manager. "That's how life is. You need to learn from your bad decisions and you have to take with you the good ones."